European Roulette is an online casino with a 97.3% RTP by Gamevy. Black or red bet. Players will have to decide if a number will be black or red. Quadrants and pairs; players will have to put their chips to bet if there will be a quadrant or a pair. Single number bet; players will have to place a bet on the next single number they think will show up. The graphics of this game is very impressive and you will definitely enjoy playing it. This game comes with a timer which begins to count after every spin. 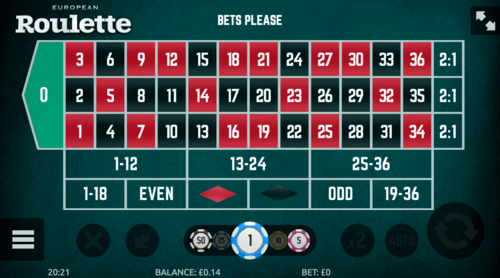 Players have just 10 seconds to place a bet after every spin, if they fail to do so, they will miss the spin and will have to wait for the spin to end. After every bet is placed using chips, players will have to confirm the bets, if they are not confirmed, the bet becomes invalid. Clearly meaning that they have to wait for the spin to end before placing another bet. This game has a return to player percentage of 97.3%.